EPISODE 10, SEASON 2- "WHAT THEY BECOME"
I have just recently become accustomed to watching lots of television. I am very unaware of mid-season finales. Are these normal in everyday television? If so, how long has been going on? Does it depend on the network, because it does not seem like it does? What I have gathered over the last few years is these finale's can work really well or they just seem like deleted scenes. The best mid-season finales answer some of the big questions the audience has been asking over the course of the first half, while also leaving the audience on a rabid enough cliffhanger to leave us ready for the next half. Other mid-season finales are mere fluff that just further set-up what the audience has been guessing for a long time. Why further set up what the audience already wants to know? Why have a mid-season finale at all? I can happily say that "Agents of S.H.I.E.L.D." gets the mid-season finale right. I won't even waste any time tonight. 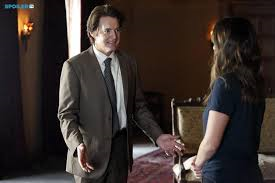 Yes, Skye (Chloe Bennett) meets her dad (Kyle MacLachlan). What I was happy about is that Skye is still quite wary and disloyal to her father, and they don't know leave the episode together, I was afraid that might happen. I am sorely glad that it didn't, no matter what though, I don't think we have seen the last of Skye's dad, and that is exciting to me still. What we do know is that The Diviner definitely unlocked something in Skye, it unlocked something in Raina (Ruth Negga) and in the most heartbreaking point, it got Agent Triplett (B.J. Britt) killed. I can't believe they killed off Triplett, I was really beginning to like Triplett. I thought for sure he'd fill the void that was left by Agent Ward (Brett Dalton) but that seems impossible at this point. I especially hate when shows kill off characters that almost met their demise earlier in the season, that just nags me more than anything. Back to the point, it seems Skye has superpowers of some kind, who she ends up being is something I am excited to see in March. Another thing I thought may happen, then did happen, and it made me unhappy, was the fate of Ward. When Skye shot him, I thought for sure he was finally going to die. But he didn't, and it seems his actions have been entirely motivated by his love for Skye. If I was a guessing man, I would assume that by the end of season 2, Ward will vindicate himself somehow and rejoin S.H.I.E.L.D. or he will sacrifice himself for Skye and the rest of the team. I kind of hate that, I thought ABC had the opportunity to do something unique and different with his character. Now, it seems they will try to bring a happy ending to everything which began at the end of season 1, and I hate the need to push a happy ending, it feels force, as this does. But Ward is still running around with Agent 33, so what will that mean in the grand scheme of things? I was surprised that Daniel Whitehall (Reed Diamond) died as well this episode. I thought Whitehall would be the Big Bad all season long, and I definitely wanted him to don the armor he has in the comic books. They made it pretty clear in this episode that the Chinese girl he operated on in his origin episode (who happened to be Skye's mother) slowed his aging, it didn't make him immortal, so I think we have seen the last of Whitehall. I really liked the work Diamond did for this series, and he was a strong villain. But, one question still remains. Who is the guy with no eyes at the very end of the episode?